The band have launched a brand new online timeline by confirming the title of their next LP. The announcement comes as the band launch a new comprehensive online history of the band, The Coldplay Timeline, charting their career from their first rehearsal in 1998 up to the present day. "Hello everyone. We are in the studio working on 'A Head Full Of Dreams'. While that's happening, Phil and Anchorman and The Oracle and Radio #42 have been getting the 'Timeline' updated." 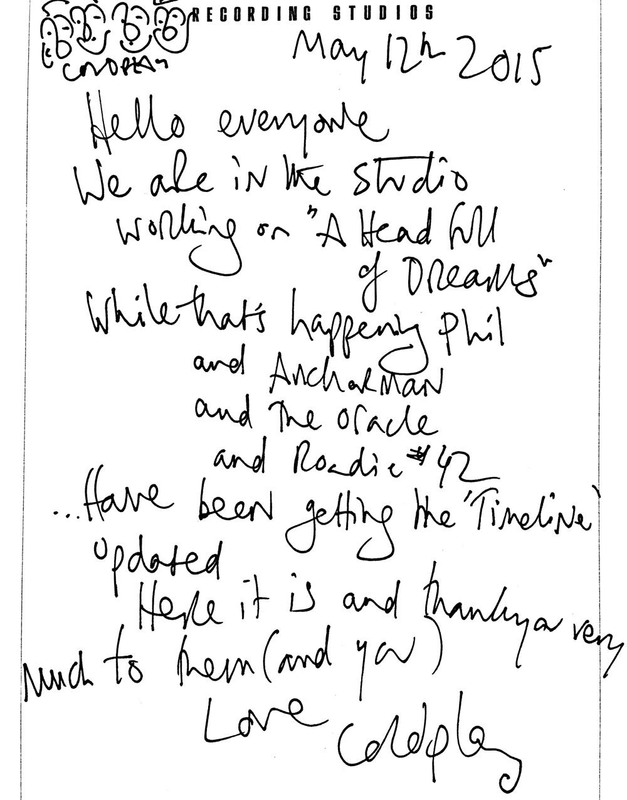 A Head Full Of Dreams is the band's sixth album, following last year's Ghost Stories. The new site allows fans to delve into the band's story through videos, audio clips, photos, features, interviews and handwritten notes. The timeline also includes the first official Coldplay gig-ography, featuring every show that the band have played.